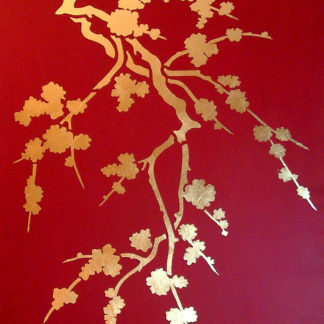 The Large Cherry Blossom Stencil is made up of exquisite cherry blossom flowers on a graceful blossom tree branch. A brilliant stencil for extra special decorating projects that require an oversize horizontal stencil design! 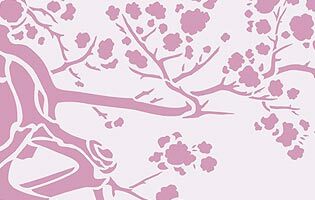 This stencil comes on three sheets, which align easily to make up the extra wide cherry blossom bough. The three sheet layout of this design, makes it a versatile stencil that is easy to adapt to fit into different spaces and shapes, repeating and adding the different sections or just stencilling the original design. The different sections can also easily be repeated and added on to create a host of blossom variations – the third sheet being particularly useful for adding extra blossom sprays into your design. See size specifications and illustration below. 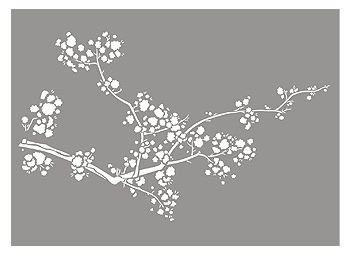 The Large Cherry Blossom Stencil looks beautiful stencilled in simple single colours on contrasting backgrounds – such as white or ivory on chalky blues, greens and greys, or in soft pinks and lilacs on pastel backgrunds – as shown in our illustrations right. 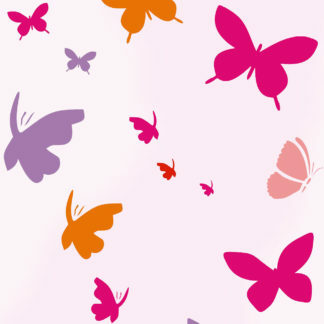 Or try soft blossom colours on faded sky backgrounds or modern pastel tones of pink, turquoise, tangerine and baby blue – this design is versatile and pretty enough to work in many settings. 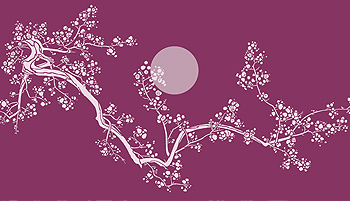 Also now available the Moon, Blossom and Stamen Details Sheet to purchase with this design. See Here. 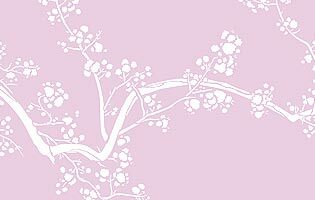 Above and below – Large Cherry Blossom in Ice White Stencil Paint on a dusky and baby pink coloured background – baby pastels are enjoying a chic, contemporary revival – and very beautiful too. Above – shows the whole stencil; below shows close up section. 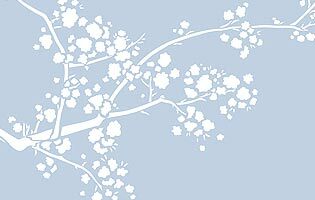 Above – Large Cherry Blossom Stencil in Ice White Stencil Paint on a soft blue background – a modern colour interpretation. Above shows whole stencil; below shows close up detail. Our oversize range is ideal for cutting edge decorators, homeowners and interior designers wanting a high specification and individual decorative finish. This design is unique to this website and not available anywhere else. 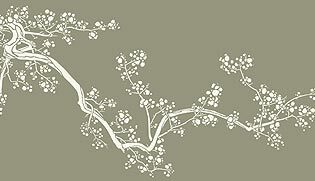 This stencil is designed for horizontal wall spaces, stencilled as a feature or on a wide panel. 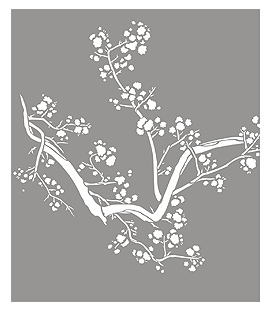 See also the smaller scale Cherry Blossom & Moon Stencil, as well as our other blossom branch stencils the Japanese Blossom Stencil, the Oleander Blossom Stencil, as well as our Blossom Sprigs, Blossom Clusters and Blossom Theme Pack stencils, which are ideal for adding to this design if required. 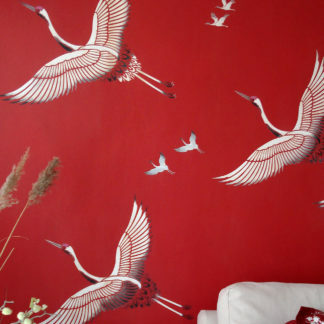 See also our Chinoiserie Stencils. 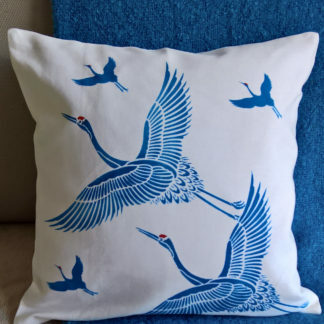 Stencil this extra large design with our Stencil Paint or Fabric Paint ranges and our Stencil Rollers and Stencil Sponges. 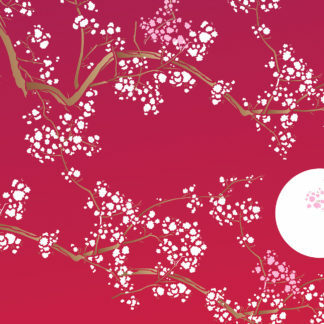 Above and below – the Large Cherry Blossom Stencil with extra blossom flowers, stamens and moon from the Details Sheet (see below to purchase) stencilled in Orchid and Plum Blossom Stencil Paints on a maroon coloured background – true Japanese style. 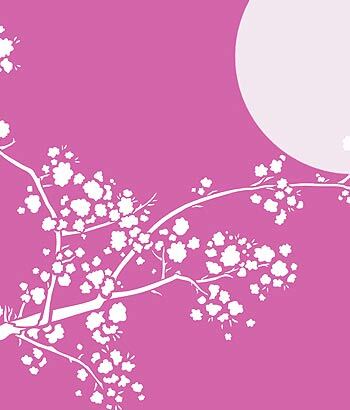 Above – close up section of the Etra Large Cherry Blossom Stencil in Ice White Stencil Paint on a candy pink background. 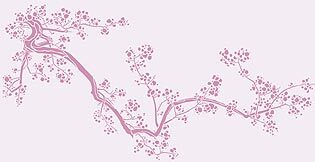 Above – Large Cherry Blossom Stencil in Plum Blossom Stencil Paint on a pale lilac background – a subtle, pretty colour scheme. Top – shows the whole stencil; above shows close up section. 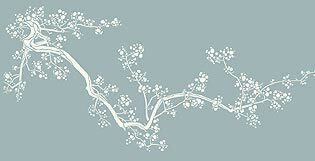 Above – Large Cherry Blossom Stencil in in Vanilla Stencil Paint on a grey-blue background – an elegant, crisp colour choice. Top – shows the whole stencil; above shows close up section. 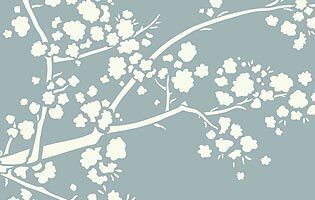 Above – Large Cherry Blossom Stencil in Vanilla Stencil Paint on an olive green background – a modern, country style colour scheme. 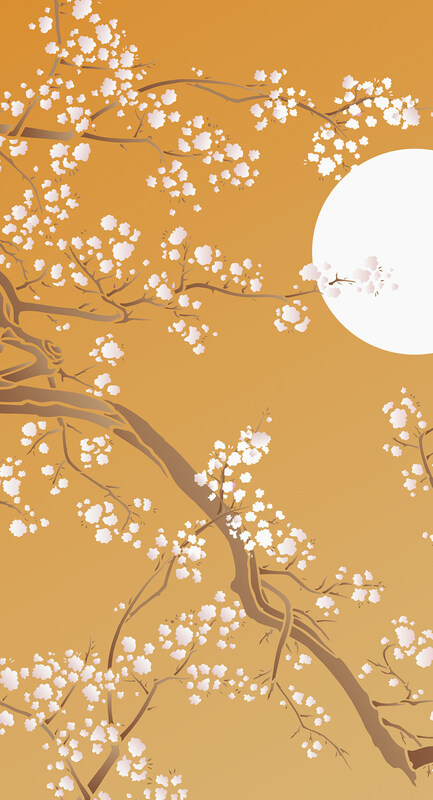 Above – the left sheet of the Large Cherry Blossom Stencil. 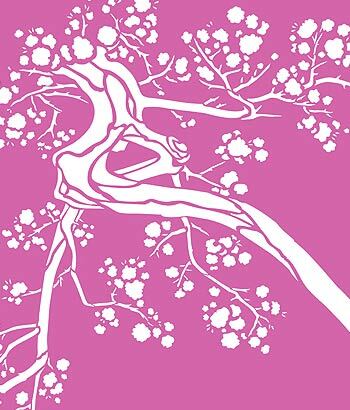 Above – the middle sheet of the Large Cherry Blossom Stencil. 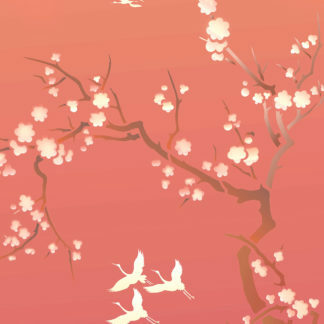 Above – the right sheet of the Large Cherry Blossom Stencil. 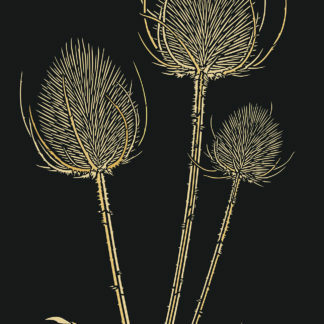 The three coloured sections of the illustration below show the three sheets of this design and how the design fits together. 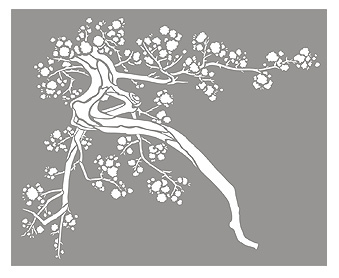 One layer stencil on three sheets with registration dots for aligning the three sections to create the large branch of blossom. Comes with full instructions. The overall horizontal cherry blossom bough design with all sections put together measures approximately 205cm (80 3/4″ – 6ft 8 3/4inches) wide x 94cm (37″ – 3ft 1 inch) deep. The blossom motifs vary in sizes from 1cm (1/2″) to 3cm (1 1/4″) with average size being approximately 2cm (3/4″). 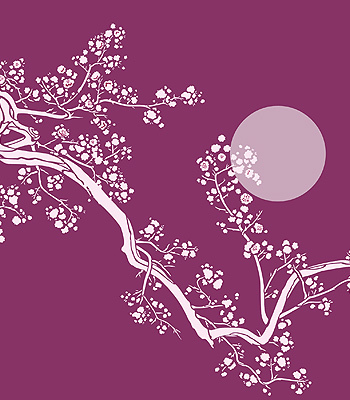 This design is virtually the same as the smaller Cherry Blossom & Moon Stencil, but has a few extra flowers added to it. 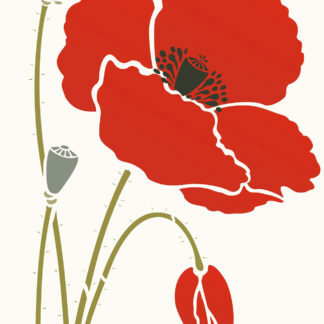 Shipping costs for this stencil are for Royal Mail 1st Class Signed For Delivery for the UK, which means 1 – 2 day delivery (after despatch) for UK customers and that the item will need signing for. Shipping for Europe, the USA and all international destinations will be by the Royal Mail International Tracked and Signed For Service, which means delivery 5 – 7 days after despatch for Europe and up to 10 days for US, Australia and other international destinations. Your order will need signing for on receipt. Email confirmation of delivery type is sent to you after ordering. Both of these services are trackable online, details of which will be emailed to you after despatch, so that you can keep track of your order online. We despatch on Mondays, Wednesdays and Fridays and accept orders up to 12pm on day of despatch for despatch on that day.